They prayed in the churches of St. John the Evangelist, St. Mary, St. Patrick, St. Anthony, Holy Trinity and Sacred Heart of Jesus. They are all places of worship that had been home to Irish, German and Slovenian immigrants in the late 19th century. Three of these parishes—St. Mary, St. Patrick and St. Anthony—now welcome large numbers of more recent immigrants from Mexico and Central and South America. Seminarian Martin Rodriguez is one of those immigrants from Mexico, and is a member of St. Mary Parish. He already knew some of the history of his home parish, which this year celebrates the 150th anniversary of its founding. But the stories of the other parishes were largely unknown to him. Rodriguez is a senior at the Bishop Simon Bruté College Seminary in Indianapolis. Seminarian Jerry Byrd, a member of St. Louis Parish in Batesville, said exploring the history of the parishes will hopefully prepare him well for his future ministry. One of the things that will help these future priests minister in the archdiocese will be the fellowship that they will build with one another. Seminarian John Hollowell, who expects to be ordained a transitional deacon in October, spoke about this while visiting St. John the Evangelist Church, the first Catholic church in Indianapolis. Hollowell, a member of Nativity of Our Lord Jesus Christ Parish in the Indianapolis South Deanery, receives his priestly formation at Saint Meinrad School of Theology. He said the archdiocesan seminarians truly enjoy being with each other. 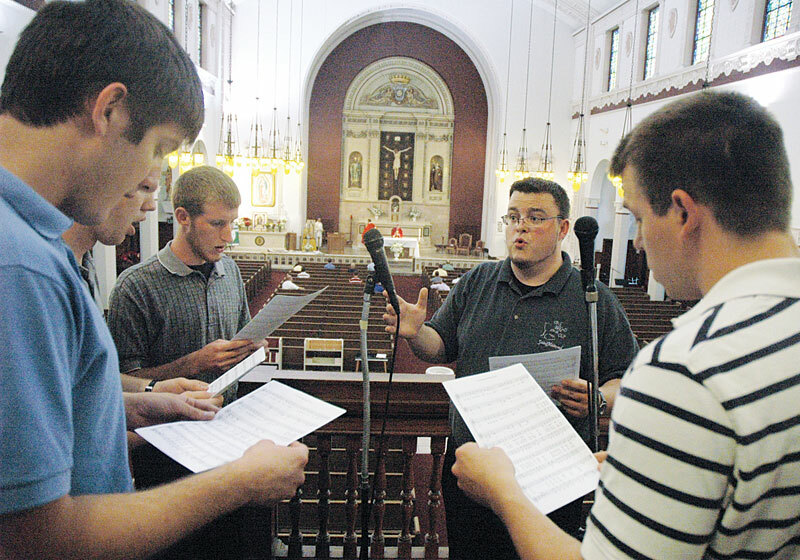 “We really have a special group of seminarians for our archdiocese,” Hollowell said. “We go to school with seminarians from lots of other dioceses. And the camaraderie and the fraternity that we have is really unique and special. Joshua Cord entered that circle of friends for the first time during the pilgrimage and the seminarian convocation at Our Lady of Fatima Retreat House in Indianapolis that led up to it. A member of St. Vincent de Paul Parish in Bedford, Cord, 26, comes to the seminary after completing four years of graduate studies in mathematics at the University of Notre Dame in northern Indiana. He will be in first philosophy at Saint Meinrad School of Theology. Toward the end of the pilgrimage, Cord and the other seminarians prayed the rosary at St. Anthony Church in the Indianapolis West Deanery. Founded in 1891, it was originally populated by Irish immigrants. But within about 15 years, a large number of Slovenian immigrants came to the parish. Shortly thereafter, Holy Trinity Parish was established nearby to accommodate the Slovenians’ cultural and linguistic needs. Byrd said the changing ethnic flavor of the six parishes’ histories highlights the universality and the robust nature of the Church over time. “There’s an ebb and flow of the faith,” Byrd said. “As people leave parishes and go to other parishes or found other parishes, the faith continues on there and someone else comes into the old parish and fulfills what was started. A highpoint in the pilgrimage for the seminarians was when Archbishop Daniel M. Buechlein celebrated Mass with them at St. Patrick Church. In his homily during the Mass, Father Eric Johnson, archdiocesan vocations director, said that while the ethnic history of the archdiocese the seminarians had experienced was important, there was something far deeper that united them to the past and the future.